Do you need siding for your Vail home or business? If you’re concerned about how the extreme climate conditions of Vail’s severely cold winters, intense high-altitude sunlight, ample rain, and hot summers will affect the integrity and appearance of your property, you probably will. With the help of the Vail siding replacement experts at Scottish Home Improvements, you can select siding that will provide your Vail residence or commercial space with the durability to withstand Colorado’s climate while also adding beauty and cutting down on future costs in the long run. Homes and businesses in Vail, Colorado are a great candidate for James Hardie® Fiber Cement Siding installation, especially because of Vail’s harsh winter weather. Fiber cement James Hardie siding preserves Vail exteriors for much longer than other siding choices, in addition to looking much more attractive than most other types of siding. In many cases, James Hardie® Siding can also be crafted to match the look and feel of real wood siding, only without the problematic maintenance issues involved in real wood siding, such as pests, warping, rotting, or cracking. And if anything ever does happen to your home, you can rest assured that your new investment will be well protected thanks to James Hardie’s outstanding warranty. While we recommend fiber cement siding highly for its beauty and durability, Scottish Home Improvements also boasts a vast array of siding options for Vail properties outside of fiber cement siding. Below, you’ll find information on just a few of the many siding options we offer in Vail and beyond. 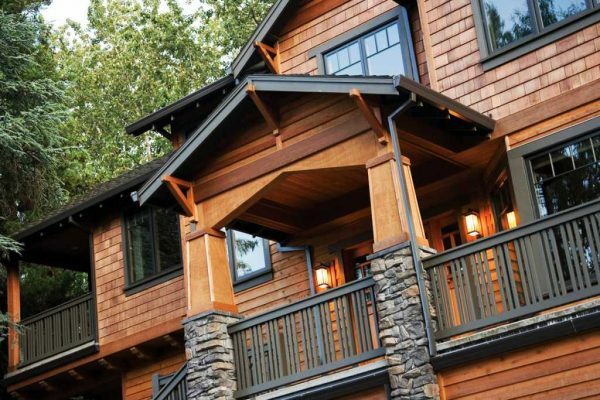 If you should choose the natural beauty of real wood instead of a more durable but less traditional type of siding, we are expert installers of a broad number of cedar siding options for Vail residential and commercial properties. We can match your cedar siding to the look and feel of your existing wood and will stain and seal the wood so that it will last as long as possible in the harsh Vail climate. If you like the look of wood siding, but are concerned about the maintenance, then LP SmartSide is the siding for you! LP SmartSide siding is durable, lightweight siding that looks just like natural wood but is designed to withstand harsh weather. It’s easy to maintain, can be installed quickly and simply, and comes in a variety of styles. Enjoy the look of real wood without the hassle or upkeep! 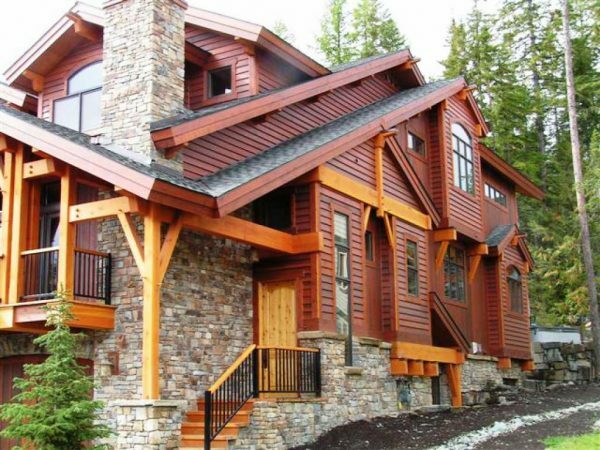 Create a look of sophistication and elegance with Sunset Stone siding for your Vail home. Stone siding looks magnificent on homes located in small mountain towns like Vail. Whether you live on the outskirts of Vail or in the middle of the city, you’re sure to love the way that natural stone makes your home blend in with your mountain surroundings. Steel siding is another choice for the Vail, Colorado region, but the aesthetics of steel have generally limited its residential use in the Vail Valley. However, steel siding options may benefit Vail businesses interested in providing their spaces with added protection against the elements at an affordable cost, promoting energy savings and reducing long term maintenance costs. Finally, stucco has made a comeback as a siding choice for Vail in the past 10 years. Whether with James Hardie® VerticalPanel® stucco-style siding, or authentic traditional stucco practices, stucco siding options cover your Vail home or business with demonstrated versatility. Although vinyl siding may work decently in other parts of Colorado, we generally do not recommend vinyl siding options in Vail because of the climate. Due to the harsh nature of the cold here, vinyl siding may crack or even shatter, leaving your home or business exposed to damaging weather conditions and detracting greatly from its appearance. Of course, when neither your budget nor your preferences call for completely replacing your current siding, Scottish Home Improvements can install a siding repair on your Vail property that will seamlessly complement the look of your home or business while adding greater protection. Colorado Siding is a resource produced by Scottish Home Improvements to discuss the siding choices of cities and towns across Colorado. Call Scottish Home Improvements today for your FREE consultation.